In the first few months of 2012, uncertainty concerning the timing and methods for exiting the Eurozone crisis and worry about the default of peripheral countries and a breakup of the Euro area negatively influenced the international stock and financial markets. Only after 26 July, following the reassurances of Mario Draghi, President of the ECB, who announced his willingness to undertake any action to defend the single currency, did world markets undergo an important recovery. The changes recorded by the principal Italian Stock Market indexes in 2012 are shown below: FTSE Italia All Share +8.4%, FTSE MIB +7.8% and FTSE Italia Mid Cap -0.4%. Acea’s share price stood at 4.554 euros in the last trading session of 2012 (capitalisation: 969.8 million euros), down by 6.83% compared to 31/12/11. In 2012 a high of 5.385 euros was recorded on 15 March with a low of 3.640 euros recorded on 13 June. During the year subject to analysis, average daily traded volumes amounted to 126,078, a considerable decrease compared to 2011 (251,780). 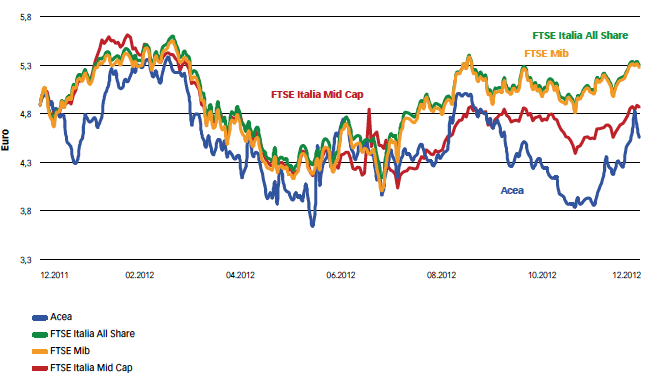 The normalised graph of ACEA’s share performance is shown below, compared with Stock Market indexes. Around 110 reports/notes were published on Acea’s share in 2012.